I read the menu and I was pretty stoked about what they had to offer. So much so that I booked a company party there without visiting first. I know, pretty brave of me. But I had a few readers (thank you Dana) recommend this place, so I was very optimistic. Since there were a few of us, we started with some appetizers. 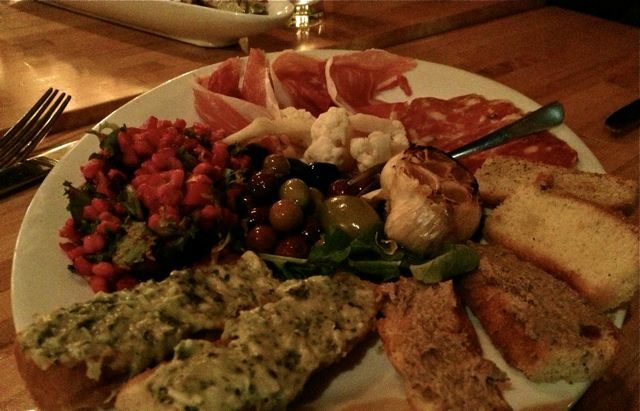 The Antipasti platter caught my attention, espeically since it didn’t have anything listed. It simply said a little of this and a little of that. You know what that means? It’s always changing. That’s a good thing, because it’s seasonal. This platter litterally had a little of this and a little of that. You can see by the picture that we had a beet farro salad, roasted garlic, a couple of salamis to try, pate and an herb spread. It was all good. I could have easily eaten that all by myself and been completely satisfied. I also saw that brussel sprouts were on the menu and it’s hard for me to not try them. It was kind of fun because someone in our group had never tried them before. They were also very good, cooked perfectly. I order the pork shoulder. It was served over polenta with a gravy. Pork shoulder is super tender and very flavorful. There was also a side of apples. I love pork done any which way. Someone ordered a pizza and I was able to snag a bite of that. I love the thin, crusty crust. 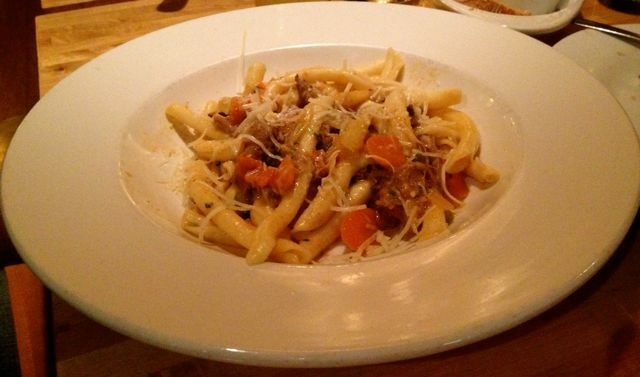 They also had a pasta dish with lamb. My husband had that one, so it was easy getting a bite of that. It was bursting with flavor. The only thing that was disapponting is it did seem a little small, but with the appetizers we all did get enough to eat. This place still makes my favorite list. We were all so stuffed that we didn’t order any dessert. As a matter of fact I didn’t even get a look at the menu to see what they offered. Update:: We went in for Brunch, which they serve on Sundays. It was fantastic. You can read all about it here. Pricing was a bit on the high side, but the meals were exceptional, so it was worth it. They had a great wine selection and some great cocktails, but they didn’t have many beer options. Service was not very good. At one point after waiting for almost 10 minutes for our drinks and seeing them sit there at the counter, we finally went and got them ourselves.